WizzAppChecker is the PUP that uses misleading techniques to prevent removal. Use Reimage to locate malicious components and get rid of them faster than with uninstall instructions. A full system scan blocks virus reappearance and prevents traffic to malicious domains. What should you know about WizzAppChecker virus? How did WizzAppChecker hijack my computer? First of all, WizzAppChecker is a potentially unwanted program (PUP), which acts like an adware program. If computer user installs this program on the computer, it will start to display annoying pop-up advertisements, place banners and also set up in-text links on the websites that user visits. These ads are very bothersome because they show up unexpectedly and cover the majority of the computer screen, which is intolerable. Many people ask how should they get rid of these ads, and there is only one way to remove them. However, let’s start from the beginning and let’s discuss what WizzAppChecker is, how it works and how can it enter the computer system. WizzAppChecker adware adds a particular extension to user’s web browsers and tracks user’s online activity. It attempts to find out user’s interests; for example, it monitors user’s browsing history, clicks, and gathers user’s search queries. All this information is collected with an intention to create targeted ads. 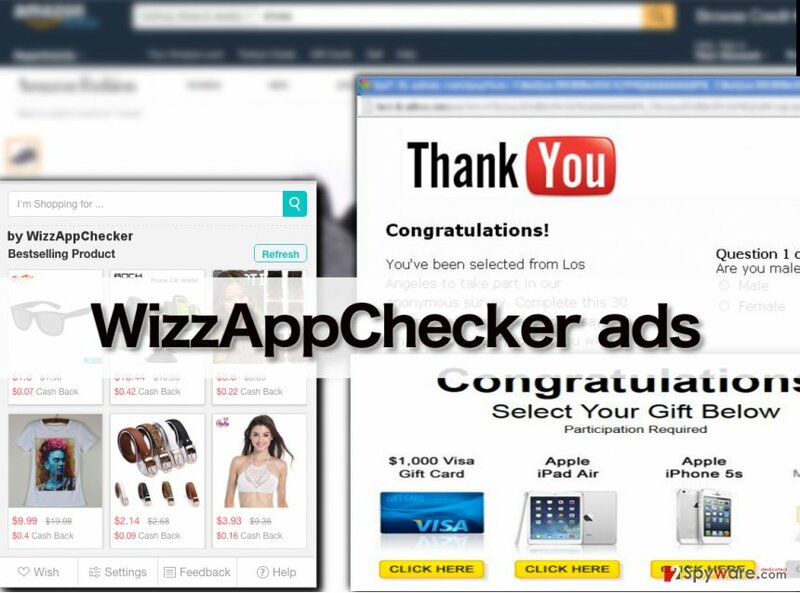 Later on, WizzAppChecker creates particular ads and displays them for the user. However, the majority of WizzAppChecker ads are worthless, because they are designed to initiate redirects to predetermined third-party websites that need to be promoted. In other words, clicking on ads by WizzAppChecker can lead users to unexpected Internet sites. We do not recommend you to click on these ads because you can accidentally end up on high-risk websites; some of such sites might promote untrustworthy or simply useless ad-supported programs, and other might try to promote questionable software updates, which can be supplemented with infectious files. We are not saying that WizzAppChecker promotes malware, but it can lead you to unreliable websites. Plus, this software slows down the computer system, which makes it hard to browse the Internet or use other software. If you have installed WizzAppChecker PUP and if you want to fix the problems it causes for you, remove WizzAppChecker from your computer. 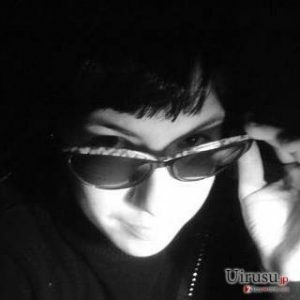 For that, you can use a reliable antispyware program, such as Reimage. Just run a system scan with it and it will detect spyware and malware. Then, choose to remove the detected threats. WizzAppChecker can be hardly useful because its primary target is to make the user visit third-party websites and promote them. If you would prefer to avoid receiving misleading advertisements and visiting questionable Internet sites, consider removing WizzAppChecker virus with an automatic spyware removal tool. Of course, you can choose an alternative removal technique and try to uninstall this adware manually. We suggest you to follow the instructions provided below. If you have any questions about this adware program, or simply if you encounter any problems while trying to remove it, contact our 2spyware support team for help. Here, look for WizzAppChecker or any other recently installed suspicious programs. Wait until you see Applications folder and look for WizzAppChecker or any other suspicious programs on it. Now right click on every of such entries and select Move to Trash. When in the new window, check Delete personal settings and select Reset again to complete WizzAppChecker removal. Once these steps are finished, WizzAppChecker should be removed from your Microsoft Edge browser. Here, select WizzAppChecker and other questionable plugins. Click Remove to delete these entries. Now you will see Reset Firefox to its default state message with Reset Firefox button. Click this button for several times and complete WizzAppChecker removal. Here, select WizzAppChecker and other malicious plugins and select trash icon to delete these entries. Click Reset to confirm this action and complete WizzAppChecker removal. Here, select Extensions and look for WizzAppChecker or other suspicious entries. Click on the Uninstall button to get rid each of them. Now you will see a detailed dialog window filled with reset options. All of those options are usually checked, but you can specify which of them you want to reset. Click the Reset button to complete WizzAppChecker removal process. This entry was posted on 2016-04-11 at 07:24 and is filed under Adware, Viruses. You can quickly scan the QR code with your mobile device and have WizzAppChecker manual removal instructions right in your pocket. How did you remove WizzAppChecker?